What are your thoughts on this subject? To quote my friend Simon, “…putting only ketchup on a hotdog is the equivalent of eating a salad composed entirely of iceberg lettuce, cheese, and ranch dressing,” although I think adding cheese is giving them too much credit. Look, everyone is entitled to their opinion, but if your opinion is pro-ketchup, just know that your opinion is wrong. You’ll have to copy and paste it, haven’t figured out how to hyperlink on here just yet. Thanks to Gayle for it. 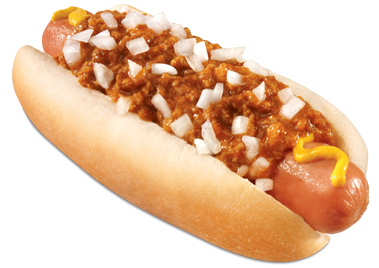 -Hot dog chili sauce. Castleberry’s is my favorite but it’s becoming harder and harder to find. Texas Pete’s is horrible. -Diced, pickled jalapenos and white onion. -A decent amount of French’s yellow mustard. All placed within a steamed Bunny brand hot dog bun. And of course no ketchup in sight. I don’t want you to even wave a bottle of the heathen sauce in my direction. I figured I’d make my inaugural blog post here on Nom Chompsky about what I consider one of Mobile’s best kept culinary secrets, Roshell’s. While not too much of a secret (they’ve been in business for quite some time, no easy feat in the fickle town that we live in), it just doesn’t garner the attention and praise that I, and others I know, feel it deserves. Roshell’s is basically the definitive “greasy spoon” joint that is stuck in times past. The type of place where there’s nary a flat screen TV to be found, and where plastic forms of payment are not accepted, but your cash or check is welcome. It’s a bona-fide hole-in-the wall with a seating capacity of probably less than 40 or 50. A small, open kitchen space is situated directly behind what is obviously a very old Formica topped sit-down lunch counter with fixed stools. A handful of booths (some of which are in a slight state of disrepair) line the wall, underneath large picture-windows still dressed with fading painted advertisements of “Burgers,” “Po-Boys,” and more. A dining room in the back has a few round tables that can seat slightly larger parties than the booths. Up until recently smoking was permitted in certain areas of the dining room. I assume a recent health department regulation, which automatically takes points off of an establishment’s health score if they allow smoking, is at the heart of the change, a change which surely was met with dismay by some regulars. The would-be Roshell’s was opened in 1953 as Mack’s Bar-Be-Que Drive Inn, by Mack Flowers Sr. A young lady by the name of Roshell started working there in 1974, and at some point married the Senior Flowers’ son, Mack Jr. They bought the store in 1989 and renamed it “Roshell’s.” They still run it today, and when you walk in, you can almost guarantee that Roshell herself will be behind the lunch counter, working the grill and plating up food. Ah, the burgers…I guess I should briefly mention the food. If you decide to follow this blog, you will undoubtedly see more than the occasional review, recipe and mention of hamburgers. It’s an area in which I am a self proclaimed expert. While I love all my food children the same, a good all-beef patty, seasoned and cooked to perfection stuck between two hearty, toasted buns, is the one I am secretly the fondest of (ssshhh…don’t tell pasta). I’ve had the burger at all of Mobile’s “famed” burger joints, and at many places not known for the sandwich, and Roshell’s easily ranks in my top two. They call them “Steer Burgers” and they are Roshell’s trademark. A big hefty patty of good quality ground beef, hand spanked and cooked just right. It’s not the type of place where you specify what temperature you want your burger done, but do know that you will not be receiving a chunk of overcooked stuff that used to be red meat, nor will you recieve a bloody mush ball. They know what they’re doing. Steer Burgers come in a variety of flavors, from your classic cheeseburger (with two types of cheese), to a bacon cheeseburger, to garlic, ranch, bleu cheese and a variety of other options. They are dressed how you want them and served on a toasted sesame seed bun with a pickle spear. But if you really want the one that I put near the top of my list, step up and get the Cheeseburger Po-boy ($7.75 with chips, sub fries for an additional charge). The secrets to making this sandwich great are not really secrets at all. 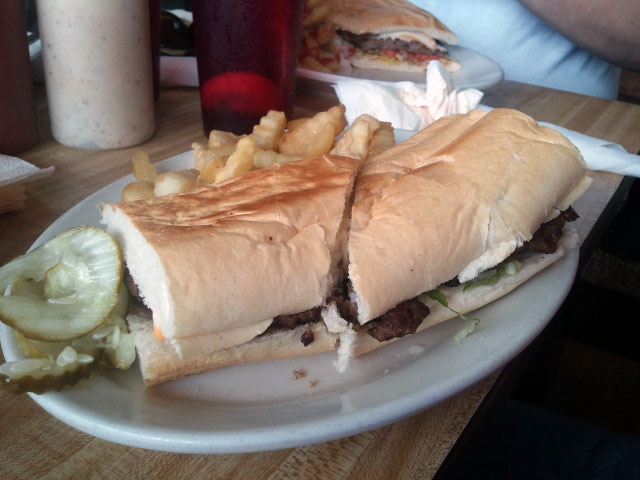 For starters, all of their po-boys are made on New Orleans’ very own Gambino’s French Bread. It’s cut into about an 8″ section, butterflied and placed in the same press-style bun toaster that they’ve been using for decades. What you get is a very hearty piece of bread, perfectly flaky and crispy on the outside, yet still chewy and hearty enough to support a serious chunk of meat. Then they hand spank a big hunk of ground beef into a nice, big, oblong patty, and cook it to perfection on the same flat-top grill that has been there since before Roshell started. That’s another thing; while they clean the grill of all excess debris and grease at the end of the day, they don’t scrub it new, either. And that’s how they produce a ridiculously tasty patty without using any crazy seasonings, spices, or sauces. The flavor is in the grill. Put these ingredients together with several slices of cheese and dress it the way you want, and you have yourself a great meal. Eat it all with fries and it’s enough caloric intake to last you all day, if you aren’t me. While the burgers are the star of the show, Roshell’s offers up a good variety of other Southern soul staples as well. Fried seafood (I hear the oysters are fantastic), gumbo, “hot-plate lunches,” and of course a broad variety of po-boys, to name a few. Her hushpuppies are a little bit legendary as well, containing onions and jalapenos. As a country boy, I love a place that offers big slices of juicy, red, beefsteak tomatoes as a side dish. On my latest excursion, my lunch companions got the red beans and rice with sausage (the special of the day), the shrimp poboy, and the Reuben, which easily competes with Callaghan’s and Butch Cassidy’s. All were met with big eyes and very soon the table was silent but for the sound of fervent mastication. 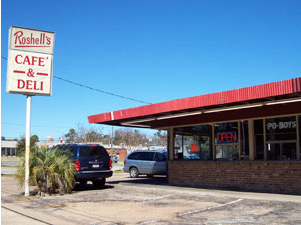 I’m not sure why Roshell’s rarely comes up in the discussion of great lunch spots and eateries in the greater Mobile area, as it is every bit a Mobile institution as the Dew Drop Inn, Callaghan’s, and Butch Cassidy’s (who are all due the praise that they get, of course). Maybe it’s the location, in the heart of Crichton. Perhaps many hipper midtowners and downtowners aren’t willing to step outside of their comfort zones. Maybe because there isn’t a plethora of plaques and antiques and knick-knacks to look at on the walls. I don’t know. What I do know is that if I want to leave all pretension and posturing aside to enjoy a meal cooked with love and dedication to simplicity and quality, I’m heading to Roshell’s. God Bless Roshell’s. Hours: Lunchtime (presumably 11am or so) til 8pm, M-F. Closed Saturday and Sunday.